I am receiving XML strings over a socket, and would like to convert these to C# objects. I am new to .Net, and am not sure the best practice for performing this. I've used JAXB for Java before, and wasn't sure if there is something similar, or if this would be handled a different way. Should work pretty well for most cases. Change location to your XML file directory by typing cd /D "C:\path\to\xml"
Simply Run Your Visual Studio 2013 as Administration ... Copy the content of your Xml file.. Go to Visual Studio 2013 > Edit > Paste Special > Paste Xml as C# Classes It will create your c# classes according to your Xml file content. Then you can use ExtendedXmlSerializer to serialize and deserialize. ExtendedXmlSerializer support .NET 4.5 or higher and .NET Core. You can integrate it with WebApi and AspCore. If you have the xsd of the xml message then you can generate c# classes using the .Net xsd.exe tool. This .Net classes can then be used to generate the xml. In addition to the other answers here you can naturally use the XmlDocument class, for XML DOM-like reading, or the XmlReader, fast forward-only reader, to do it "by hand". Another way with an Advanced xsd to c# classes generation Tools : xsd2code.com. This tool is very handy and powerfull. It has a lot more customisation than the xsd.exe tool from Visual Studio. Xsd2Code++ can be customised to use Lists or Arrays and supports large schemas with a lot of Import statements. Generates business objects from XSD Schema or XML file to flexible C# or Visual Basic code. Generate XML read and write methods (serialization/deserialization). Not the answer you're looking for? 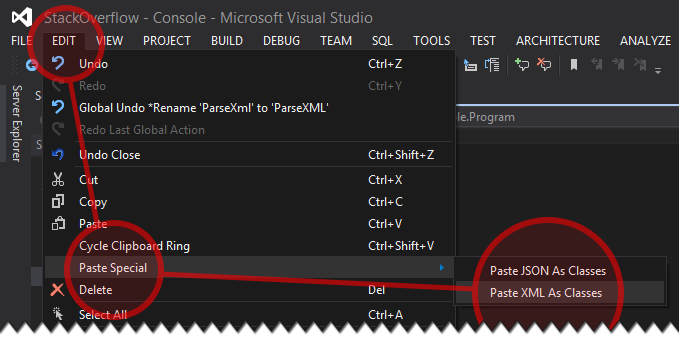 Browse other questions tagged c# xml xml-parsing xml-serialization or ask your own question. How to convert complex XML to .NET Class? How to get value of some object in XML string in C#?